It’s that time again, meal preppers! 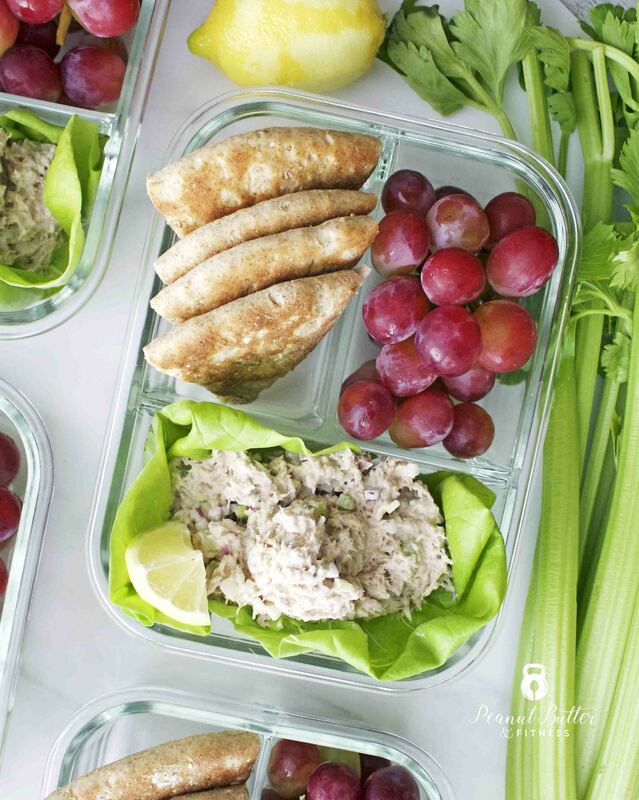 This week for #MealPrepMonday I’m featuring a lunchbox classic – Tuna Salad, but meal prep style. Instead of the white bread and fake cheese from back in the day, I opted for whole grain pita bread and some lemon juice fresh squeezed over the tuna salad. Don’t get me wrong, I love a good tuna melt, but I try to keep my dairy intake to a minimum these days. You can always add a slice of cheese before serving though. When it comes to tuna selection, it can be a bit confusing which one to choose. 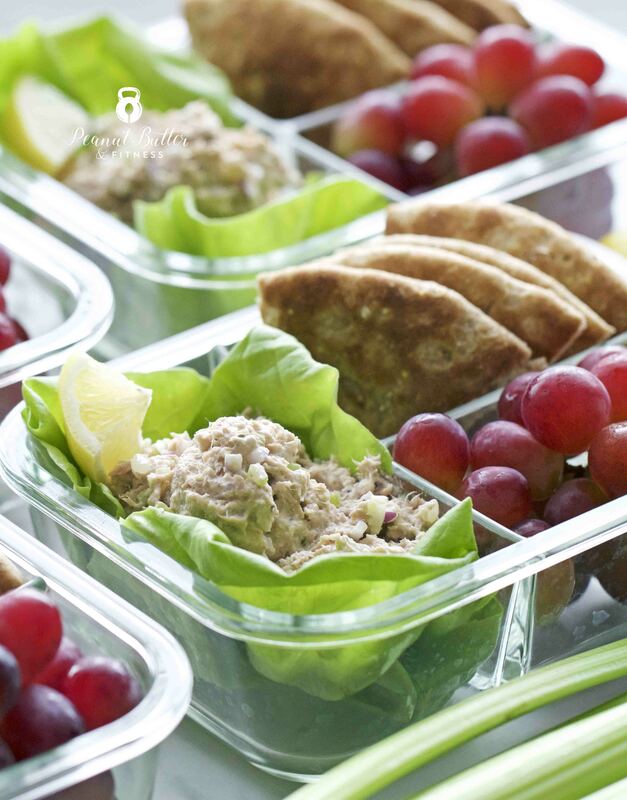 I personally like a mixture of chunk light tuna (pretty much the standard for tuna salad) and chunk white albacore. 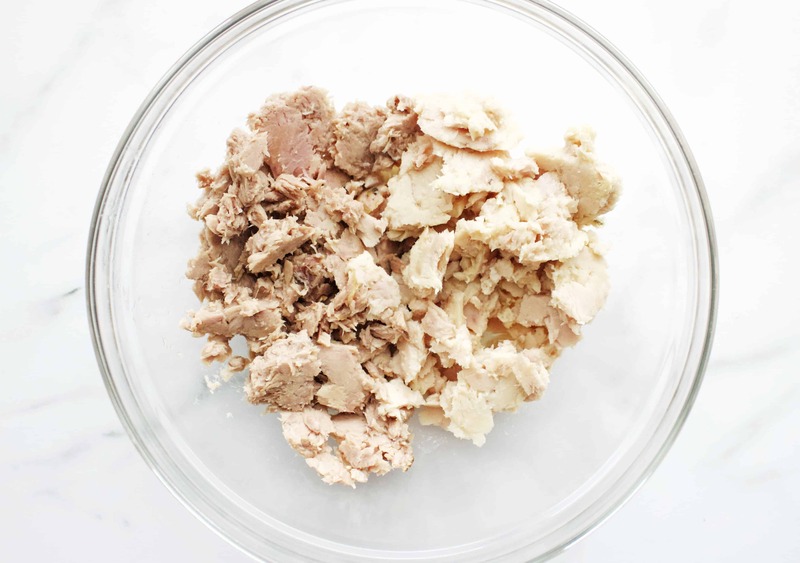 Albacore is the one you see on the right in the photo below…it’s lighter in color and milder in flavor, but it’s also a bit firmer than chunk light, so I use more chunk light than albacore in my recipe. 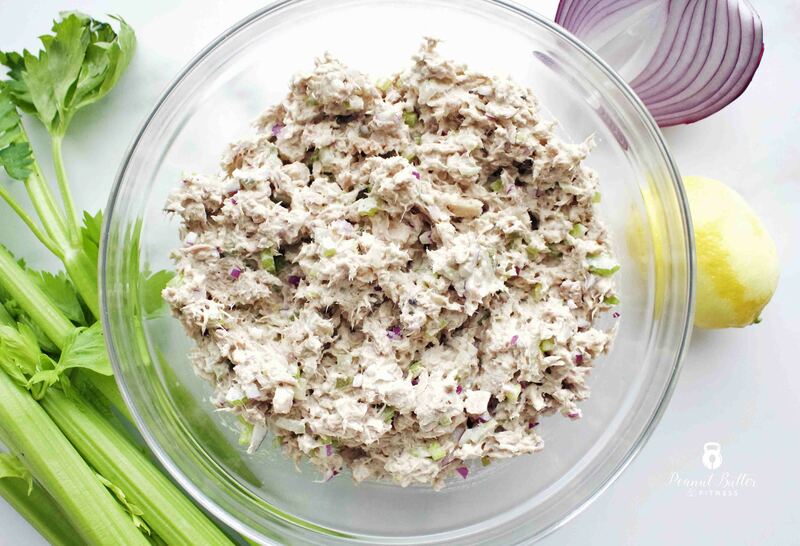 You’ll see in the recipe that I list out the tuna according to the drained weight, not the canned or pouch weight. 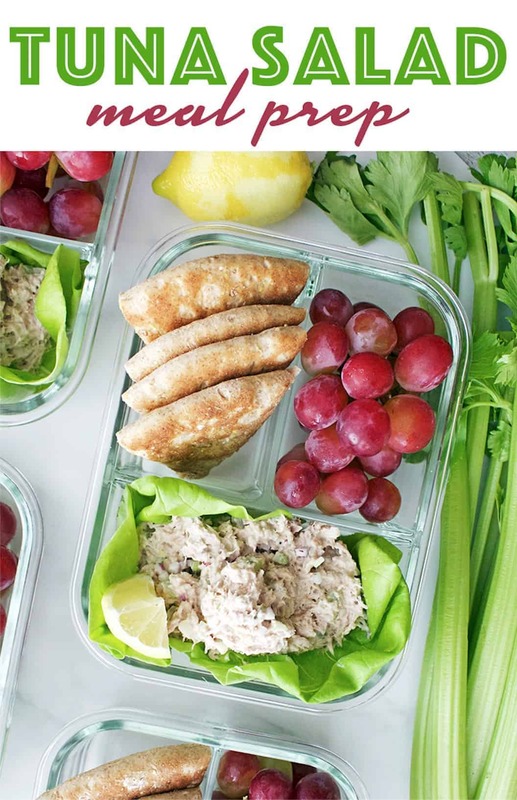 When you buy it in a can, there’s usually about 1-2 oz of water weight included in the canned weight…so for a 5 oz can, you only get 4 oz of tuna. It’s all listed out on the nutrition info on the back. 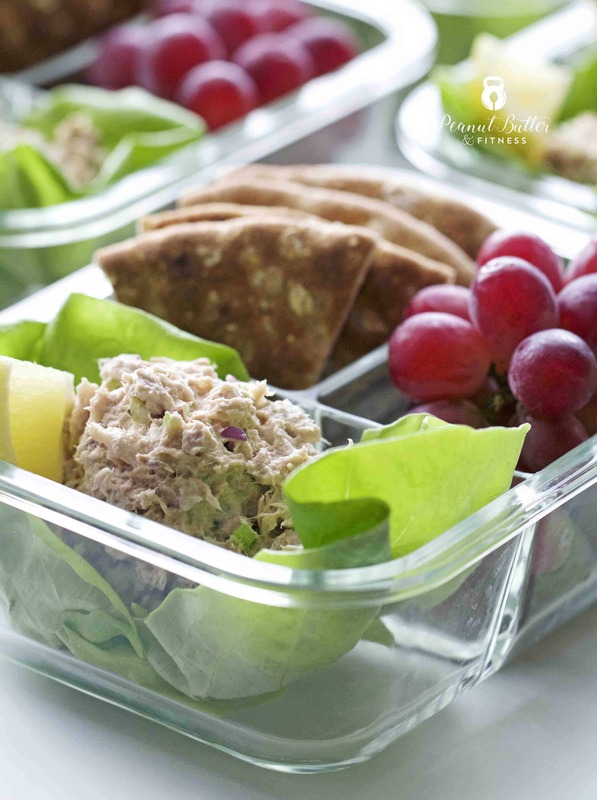 Bottom line – you need about 18-20 oz of tuna total, regardless of whether it comes from cans or pouches, or whether you decide to use all chunk light or some combo of chunk light and albacore. Add all ingredients to a bowl and mix until well combined. Don’t forget to pick up some good meal prep containers! This looks like a PERFECT meal prep. Question: does this actually last 5 days in the fridge? Or do you freeze some for the later part of the week? I follow you on Facebook, love your recipes! Thanks Rachel, glad you’re here! 🙂 Mine lasted 5 days without a problem – the lettuce will wilt underneath the tuna after a couple days, but I didn’t really eat that part anyway. I usually don’t freeze my meals unless I know I’ll be needing them 6-7+ days later and even then I’m selective about which ones I freeze. Hope that helps!